Brown believes his side should have been awarded a throw-in in the build-up to a free-kick from which United scored the opening goal. "We just felt let down by an official not doing his job," Brown said of Gary Mackay-Steven's run on the touchline. "It definitely shows on the TV that the ball was out for a throw-in." The interim Dens Park manager added: "I was right beside it. Ultimately that's cost us the game. Our club, it's cost us a semi-final place or a replay. "We matched up and competed with United. We've got to wish United all the best in the semi-final." Goals from Brian McLean and Mackay-Steven, which sandwiched Jim McAlister's leveller, booked the visitors a place in Monday's draw. 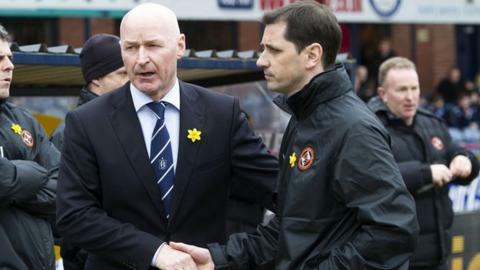 And Jackie McNamara was pleased with his side's "battling" qualities in the city derby. "I don't think it was a pretty game but when we did pass the ball we caused them problems," added the United boss. "We probably scored the second goal, the winner, against the run of play. "For everybody connected with the club, we're just delighted to be in the next round. It's massive, the financial side of it and just the feel-good factor with fans, they're sent away happy. "We'll hopefully get a good draw and try and get in the final."